The Canon EOS 7D Mark II is one of Canon’s top APS-C SLRs. Upgraded to a full 20.2 megapixels. This model now includes the highly acclaimed Dual Pixel autofocus system introduced on the Canon 70D. This Dual Pixel technology allows your DSLR to shoot like a camcorder, and have faster (more accurate) AF for still shots. The new HD movie mode can now shoot Full 1080p HD Video at faster frame rates 1080p @60fps and with manual exposure control. HDMI port to hookup to an HDTV, monitor, or an external recorder. External Microphone & Headphone Jacks are provided. 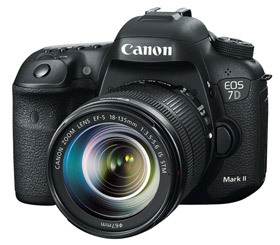 The 7D Mark II includes many features formerly reserved for Canon’s top SLRs including, Blazing Fast 10.0 fps continuous shooting, and 65 AF focus points. The high resolution 3-inch LCD screen (1,040,000 dots) can be used with the Live View Function for composition of both pictures and video. EOS Dust Removal System removes dust from the sensor automatically. The 7D Mark II’s magnesium alloy body is dust and weather resistant and has shutter durability of up to 200,000 cycles. More Features: The Canon EOS 7D Mark II’s Intelligent Viewfinder has 100% field of view and a wide viewing angle. Greatly improved low light performance, including ISO 100-16000 (expandable to 25600). Improved 63-zone evaluative metering system. A display off sensor, turns off the LCD when you are looking through the viewfinder. Zone AF divides the 65 AF points (all cross-type). Compatibility with over 60 Canon EF Lenses. Upgraded to Dual DIGIC 6 Image Processors which provides fast, accurate image processing and faster startup time. The 7D Mark II has more processing power than any other Canon DSLR to date. Upgraded 150,000-pixel RGB+IR Metering sensor for scene recognition, and subject tracking. Upgrade features for the 7D Mark II: Upgraded to 20.2 megapixels, added Dual Pixel CMOS AF, added HDR (high dynamic range) feature, added meter assisted AF tracking, Movie mode goes to 60p, added Movie Servo AF (focus speed can be adjusted), Video compression adds All-I, IPB, and IPB-Lite codecs, added a headphone jack, AF focus points jumps to 65(from 19), USB 3.0 connectivity, ISO jumps to 100-16,000, shutter durability jumps to 200,000 cycles, reduced vibrations from high speed shooting with the added mirror vibration control technology, Burst rate increases to 10 fps, add uncompressed HDMI out for video (8-bit 4:2:2), Built in GPS & Digital Compass, Higher resolution LCD, In-Camera lens aberration corrections enabled, dual CF and SD card slots. Shutter speeds: 30 – 1/8000 second, ISO: from 100-16000, Burst Mode: 10.0 fps, Built-in Flash. Memory Cards: Dual CF Card and SD Card slots. Type I and II, UDMA-compliant. Lithium-ion battery LP-E6N (included). USB 3.0. Dimensions: 5.8″ x 4.4″ x 3.1″ ( 28.9 ounces w/ battery). Smart-Review Commentary: For 2015-2016, Canon’s 7D Mark II is at the top of its game for its price range. It is a massive improvement over the 7D it replaces. This camera has many features that previously were only included on high end SLRs, including Dual DIGIC 6 Image Processors, 65 AF points, the new Dual Pixel CMOS, and higher shutter durability. Dual Pixel CMOS is a huge breakthrough in AF technology which we have seen on our Canon 70D. The HD movie capture has improved dramatically and now supports 1080p at 60 frames/second (blu-ray quality), and has added better compression algorithms (All-I), and even an uncompressed HDMI out to record uncompressed video to a digital recorder. With Dual Pixel CMOS and Movie Servo AF, the 7D Mark II can now operate like a camcorder, and support the new silent STM lenses. We are glad to see the addition of a headphone jack for monitoring audio while shooting video. Note that the 7D Mark II does not have a touchscreen like the Canon 80D. In the SLR mode this camera has a blazing fast 10.0 frames/second burst mode thanks to the new Dual Digic 6 processors. It also sports a durable magnesium body and 200,000 shutter cycles. Not only does this camera have more megapixels (20.2), but the light sensitivity has improved with an ISO up to 16000. The Canon 7D Mark II has all the popular features such as, Ultrasonic Sensor cleaning and LiveView which allows you to use your LCD screen to compose your shot instead of the viewfinder. If you are looking for one of the best digital SLRs in this price range, the Canon 7D Mark II is a Smart-Review Top Pick. Canon EOS 7D Mark II Lens Compatibility: The 7D Mark II is compatible with over 60 EF and EF-S lenses. The EF-S lenses are specifically designed for APS-C imager SLRs such as the 7D Mark II. APS-C SLRs have a focal length conversion factor of 1.6 compared to full frame SLRs. Wide Angle, Zoom, Macro, and Prime Lenses are available.